Our woodworking tools are now available for purchase. 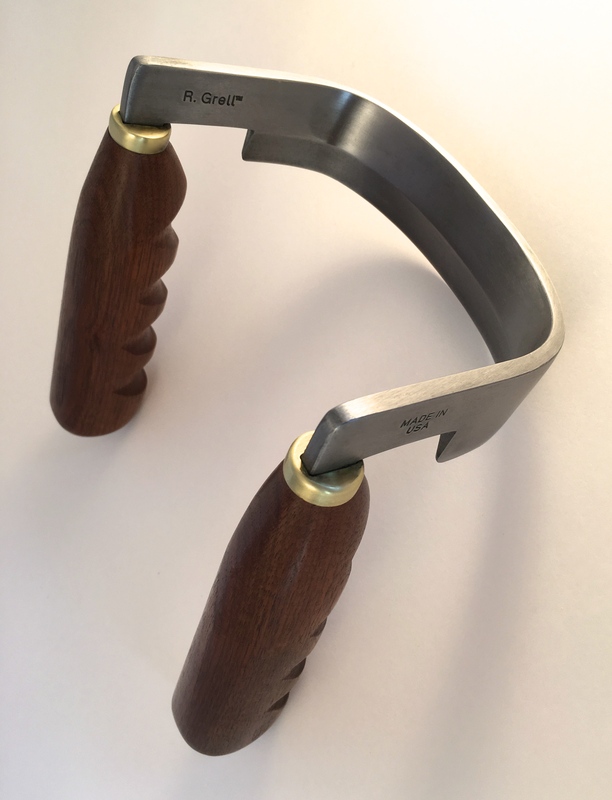 You can purchase this Drawknife woodworking tool made by Richard Grell. This unique Drawknife is a replica of a 200-year-old gem given to me by my grandfather when I was five. 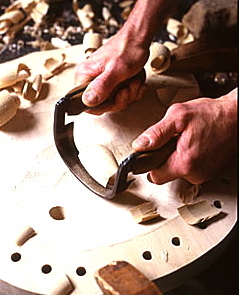 The blade is beveled on both sides, a rare characteristic of drawknives. 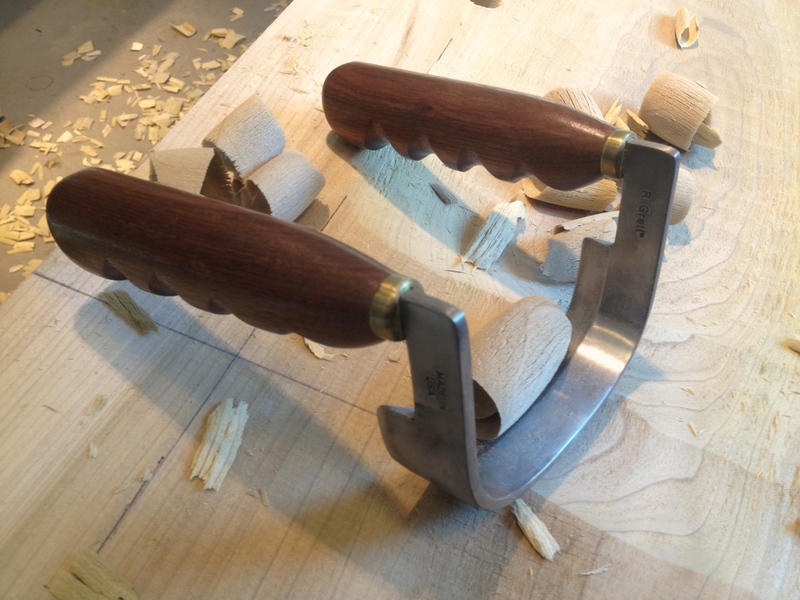 Its size, balance, and blade make an excellent tool for fine woodworking tasks. The tool steel is made in the USA and undergoes extensive heat-treating processes and sharpening. The handles are turned in my workshop using wood from a walnut tree taken out by a storm on my farm in 1976. The logs were sawed at the historic Hale Farm and Village, Bath, Ohio using a 19th century steam-powered sawmill. Click here to order the Drawknife from our secure shopping cart. Detail of the Drawknife handle and blade edge. 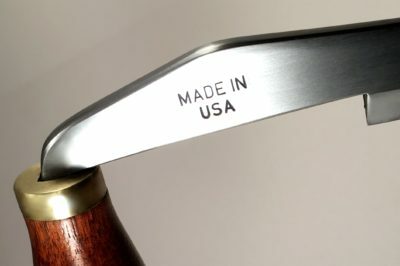 All of our tools are handmade here in the USA. 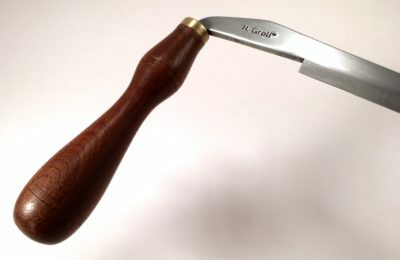 You can purchase this replica Inshave woodworking tool made by Richard Grell. This exclusive Inshave, also called a Scorp, is a replica of one I designed. 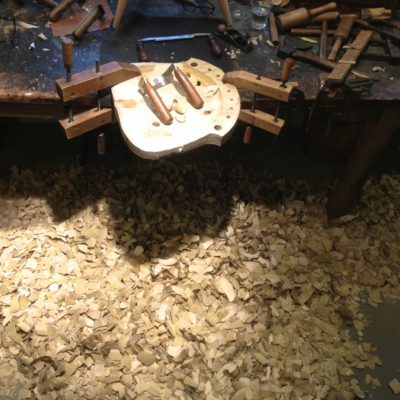 When I built my first Windsor chair in 1972, frustration quickly set in when carving the poplar seat with the tools offered at that time. I realized the appropriate hand tool for this process wasn’t available. Designing and creating my own Inshave became a necessity. 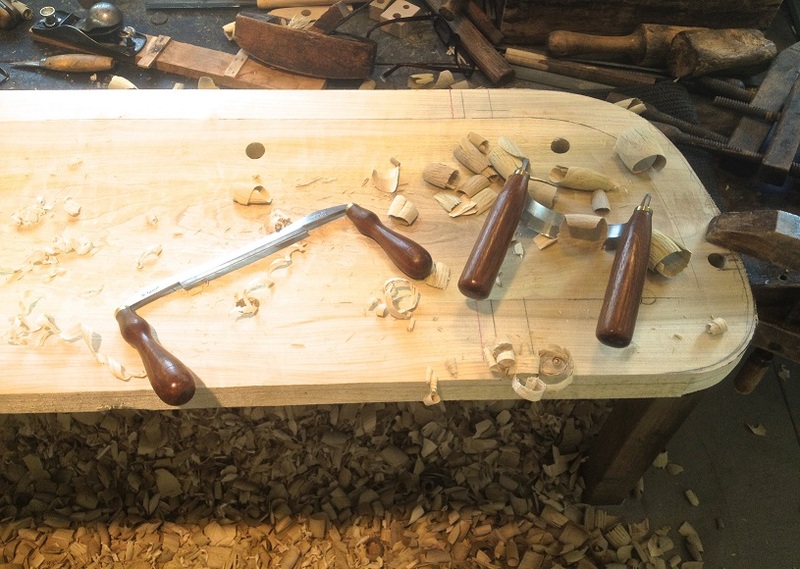 The result was an Inshave that I made, and have been using to build Windsor chairs since that time. My Inshave was the only one of its kind, until now. 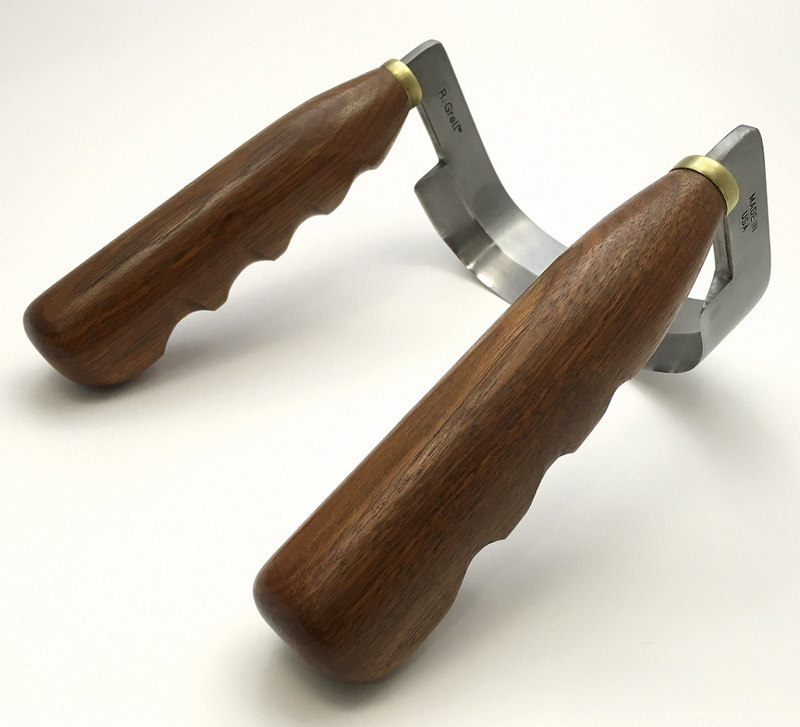 Today the result is a refined design of the original tool that I created incorporating the same acute and proper blade angles, and handles with finger grips making this tool extremely functional, efficient, and a pleasure to use. The tool steel used is made in the USA and undergoes extensive heat-treating processes and sharpening. The handles are hand shaped in my workshop using wood from a walnut tree taken out by a storm on my farm in 1976. The logs were sawed at the historic Hale Farm and Village in Bath, Ohio using a 19th century steam-powered sawmill. Click here to order the Inshave, aka Scorp from our secure shopping cart. 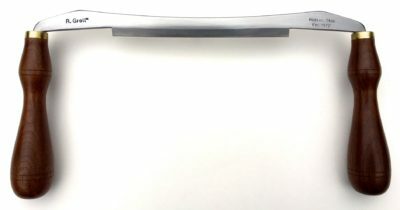 Detail of the Inshave blade. 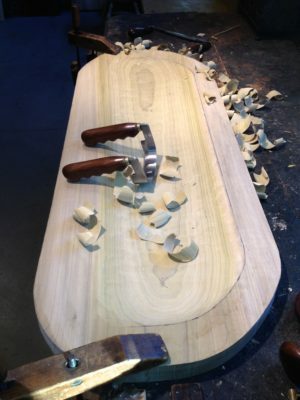 Inshave carving a poplar wood seat. Poplar seat clamped for carving. Note the mountain of wood chips! Settee poplar 48 inch long wood seat. The Inshave blade has acute and proper blade angles for carving.